A look at your user preferences for non-admin users. This article is for normal users of Method, not for Administrators. 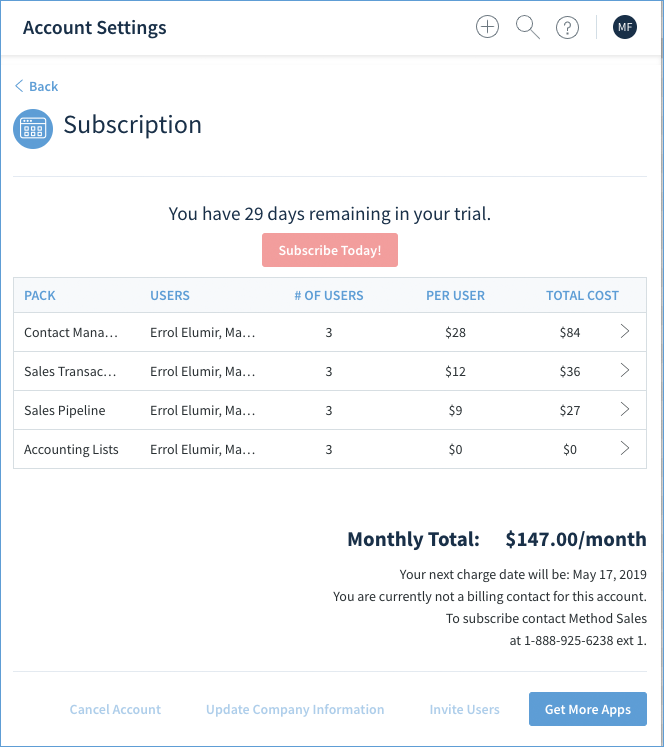 If you are an admin, please see our article Your Company Preferences. 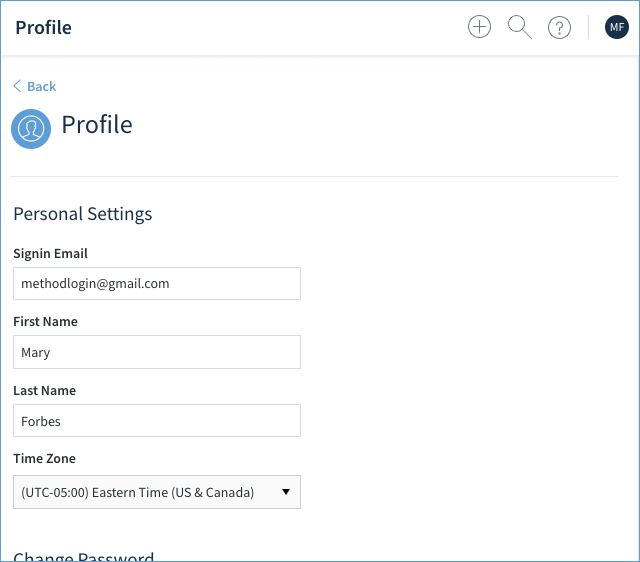 User Profile: settings related to your sign-in and authentication. 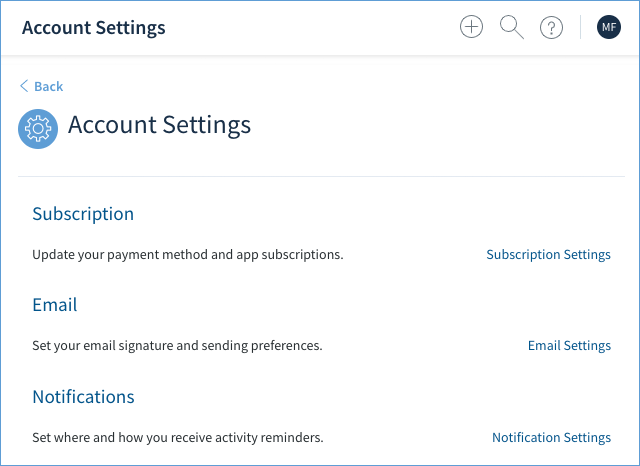 Account Settings: settings related to how your Method account is set up. We'll cover both of them in this article. 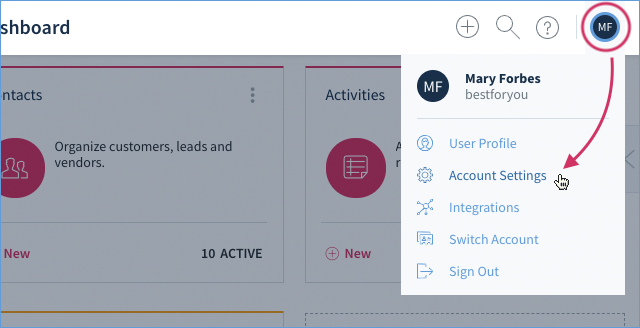 Your User Profile preferences are accessed by clicking the upper-right blue circle icon and then clicking User Profile. This will take you to your profile page which is divided into into three sub-sections. At the bottom of the screen is a Save button to save your settings. Signin Email: The email the user uses to sign into Method. Last Name: The user's last name. Time Zone: Your time zone can be set here. NOTE: The first name and last name do not correspond to this user's User Name which appears throughout Method. Only an administrator can change the User Name. To change a password, input the current password, then choose and confirm a new password. At least 1 uppercase letter. At least 1 symbol from @$-_.+! *'(),"
Your preferences are accessed by clicking the upper-right blue circle icon and then clicking Account Settings. 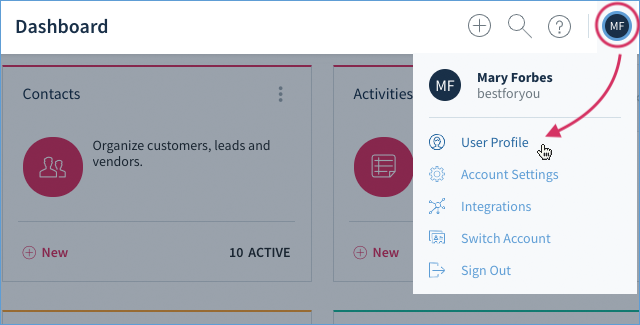 Note, users with the Customizer permission set will also see the Tables & Fields settings. Although you will be able to view the screen, a user without administrator permissions will be unable to make any changes to this screen. Email Address: This field is the “from” email when you send an email out from Method. This is also where your internal email notifications are sent. Note: some customizations may override this for another email. Email Signature: The text input box, although not labeled, is your email signature and may be included in emails sent out from this user. Note: not all email templates include the email signature. - When checked, you will use the outgoing email server as set up for your company. - When unchecked, you can specify a different outgoing email server to be used. Note that this will not allow you to receive email. Method is not an email client, and will not receive emails sent to you. For more information on this, please see our article Set Up Your Email Server. 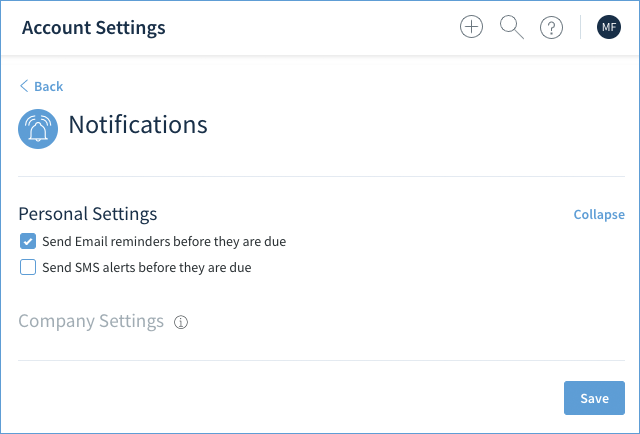 This section details allows configuration for notifiaction reminders sent out when an Activity assigned to them is coming due. Reminders can come via email and SMS. 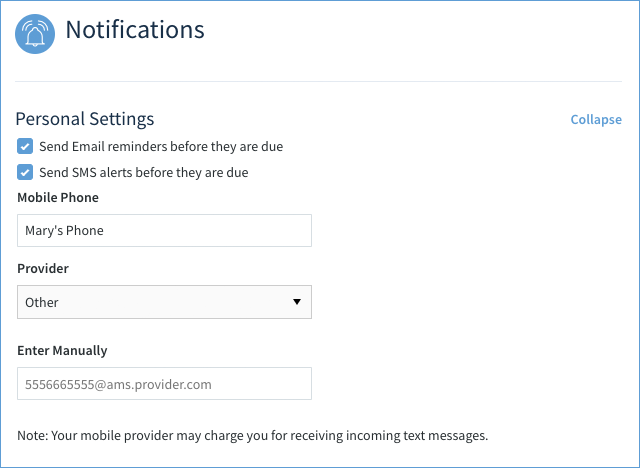 By default, email reminders are turned on and SMS reminders are turned off. If you choose to deactivate email reminders, no email will be sent to remind this user of an upcoming activity. If you choose to activate SMS reminders, you’ll need to provide your mobile phone number and provider. Your provider might charge you for incoming texts from Method, depending on your personal plan. Selecting “Other” as your provider will give you the ability to manually enter your SMS gateway domain. Use this functionality if you’re experiencing issues with our preset providers.